For the sales of post-war and contemporary art in London in June Christie’s had decided to not do any auctions. As a result of this we can see a drop in sales value that probably would have been a lot less notable, or possibly even an increase, had Christie’s also held their regular auction. The post-war and contemporary art day sales in London this week raised a total of £16,164,000 (excluding buyer’s premium), against a total pre-sale estimate of £15,647,000 to £22,212,000. The total sales value between the two auction houses was 7.7% lower than in June 2016, and 16.5% below the February/March results this year (not including Christie’s day sales total on either occasion). 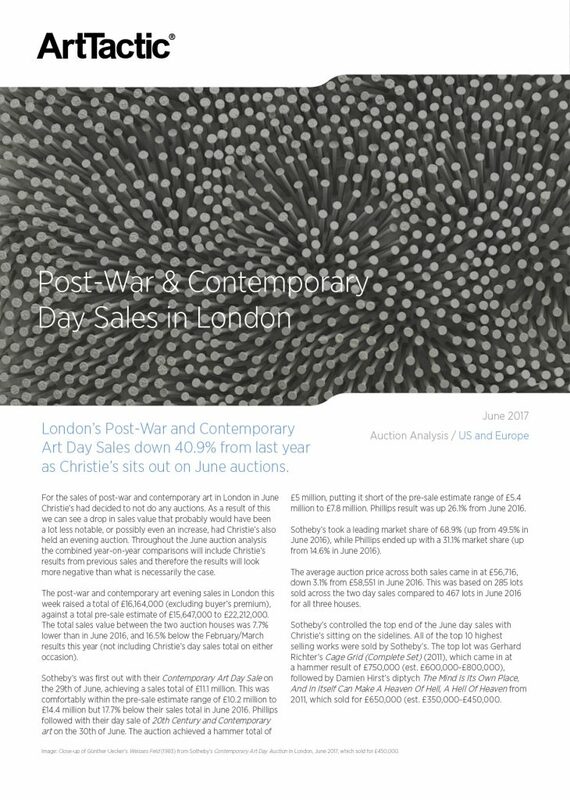 Sotheby’s was first out with their Contemporary Art Day Sale on the 29th of June, achieving a sales total of £11.1 million. This was comfortably within the pre-sale estimate range of £10.2 million to £14.4 million but 17.7% below their sales total in June 2016. Phillips followed with their day sale of 20th Century and Contemporary art on the 30th of June. The auction achieved a hammer total of £5 million, putting it short of the pre-sale estimate range of £5.4 million to £7.8 million. Phillips result was up 26.1% from June 2016. COMPARATIVE PERFORMANCE (SOTHEBY’S AND PHILLIPS). TOTAL SALES VS ESTIMATE (2008 – 2017). AVERAGE PRICES 2008 – 2017. HAMMER VS ESTIMATE RATIOS 2008 – 2017. TOP AUCTION PRICES & TOP PERFORMING LOTS. The post-war and contemporary art day sales in London this week raised a total of £16,164,000 (excluding buyer’s premium), against a total pre-sale estimate of £15,647,000 to £22,212,000.